This article is about the kingdom prior to the independence of Luxembourg and Belgium. 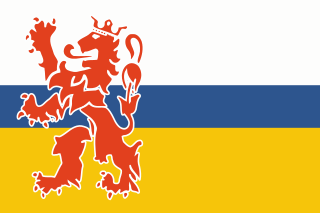 For the modern kingdom, see Kingdom of the Netherlands. "Those in whom Dutch blood"
Location of the United Kingdom of the Netherlands (dark green) in 1815 in Europe (dark grey). The Grand Duchy of Luxembourg (light green) is also shown. 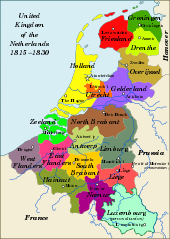 Before the French Revolutionary Wars (1792-1802), the Low Countries was a patchwork of different polities created by the Eighty Years' War (1568-1648). 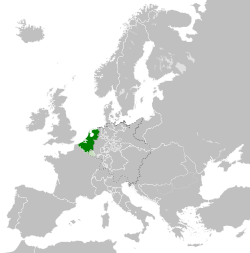 The Dutch Republic in the north was independent, while the Southern Netherlands was split between the Austrian Netherlands and Prince-Bishopric of Liège. The former was part of Habsburg Austria and both were part of the Holy Roman Empire. In the aftermath of the French Revolution, the War of the First Coalition broke out in 1792 and France was invaded by Prussia and the Holy Roman Empire. After two years of fighting, the Austrian Netherlands and Liège were captured by the French in 1794 and annexed into France. The Dutch Republic collapsed in 1795 and became a French client state. In 1813, the Netherlands was liberated from French rule by Prussian and Russian troops during the Napoleonic Wars. 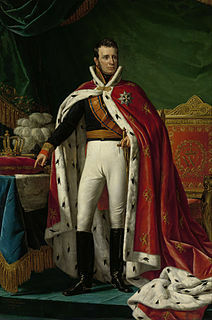 It was taken for granted that any new regime would have to be headed by the son of the last Dutch stadhouder, William Frederik of Orange-Nassau. A provisional government was formed, most of whose members had helped drive out the House of Orange 18 years earlier. However, they realised that it would be better in the long term to offer leadership of the new government to William Frederik themselves rather than have him imposed by the allies. Accordingly, William Frederick was installed as the "sovereign prince" of a new Sovereign Principality of the United Netherlands. The future of the Southern Netherlands, however, was less clear. In June 1814, the Great Powers secretly agreed to the Eight Articles of London which allocated the region to the Dutch as William had advocated. That August, William Frederik was made Governor-General of the Southern Netherlands and the Prince-Bishopric of Liège–almost all of what is now Belgium. 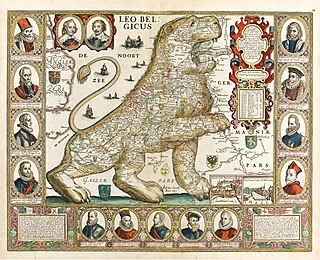 For all intents and purposes, William Frederik had completed his family's three-century dream of uniting the Low Countries under a single rule. Discussions on the future of the region were still ongoing at the Congress of Vienna when Napoleon attempted to return to power in the "Hundred Days". William used the occasion to declare himself king on 16 March 1815 as William I. After the Battle of Waterloo, discussions continued. 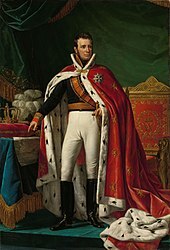 In exchange for the Southern Netherlands, William agreed to cede the Principality of Orange-Nassau and parts of the Liège to Prussia on 31 May 1815. In exchange, William also gained control over the Duchy of Luxembourg, which was elevated to a grand duchy and placed in personal and political union with the Netherlands, though it remained part of the German Confederation. Though the United Netherlands was a constitutional monarchy, the king retained significant control as head of state and head of government. Beneath the king was a bicameral legislature known as the States General with a Senate and House of Representatives. From the start, the administrative system proved controversial. Representation in the 110-seat House of Representatives, for example, was divided equally between south and north, although the former had a larger population. This was resented in the south, which believed that the government was dominated by northerners. The United Netherlands was also a colonial power with overseas colonies in the East Indies and elsewhere. Economically, the United Netherlands prospered. Supported by the state, the Industrial Revolution began to affect the Southern Netherlands where a number of modern industries emerged, encouraged by figures such as John Cockerill who created the steel industry in Wallonia. 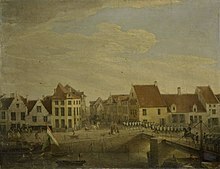 Antwerp emerged as major trading port. William I actively supported economic modernisation. Modern universities were established at Leuven, Liège, and Ghent in 1817. Lower education was also extended. The General Netherlands Society for Advancing National Industry (Algemeene Nederlandsche Maatschappij ter Begunstiging van de Volksvlijt) was created in 1822 to encourage industrialisation in the south, while the Netherlands Trading Society (Nederlandsche Handel-Maatschappij) was created in 1825 to encourage trade with the colonies. William I also embarked on a programme of canal building that saw the creation of the North Holland, Ghent–Terneuzen and Brussels–Charleroi canals. Differences between Southern and Northern Netherlands were never totally effaced. The two were divided by the issue of religion because the south was strongly Roman Catholic and the north largely Dutch Reformed. The Catholic Church in Belgium resented the state's encroachment on its traditional privileges, especially in education. In French-speaking parts of the south, attempts to enforce the use of Dutch language were particularly resented among the elite. Many Belgians believed that the United Netherlands' constitution discriminated against them. Though they represented 62 percent of the population, they were only allocated 50 percent of the seats in the House and less in the Senate while the state extracted money from the richer south to subsidise the north. By the mid-1820s, a union of opposition had formed in Belgium, uniting liberals and Catholic conservatives against Dutch rule. The Belgian Revolution broke out on 25 August 1830, inspired by the recent July Revolution in France. A military intervention in September failed to defeat the rebels in Brussels, radicalising the movement. Belgium was declared an independent state on 4 October 1830. A constitutional monarchy was established under King Leopold I.
William I refused to accept the secession of Belgium. In August 1831, he launched the Ten Days' Campaign, a major military offensive into Belgium. Though initially successful, the French intervened to support the Belgians and the invasion had to be abandoned. 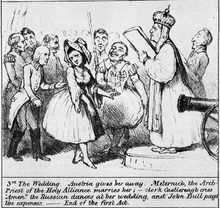 After a period of tension, a settlement was agreed at the Treaty of London in 1839. The Dutch recognised Belgian independence, in exchange for territorial concessions. The frontier between the two countries was finally fixed by the Treaty of Maastricht in 1843. Luxembourg became an autonomous state in personal union with the Dutch, though ceding some territory to Belgium. 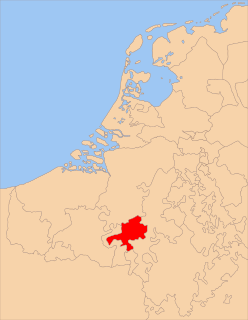 Limburg is the southernmost of the 12 provinces of the Netherlands. It is in the southeastern part of the country, stretched out from the north, where it touches the province of Gelderland, to the south, where it internationally borders Belgium. Its northern part has the North Brabant province to its west. Its long eastern boundary is the international border with the German state of North Rhine-Westphalia. Much of the west border runs along the River Maas, bordering the Flemish province of Limburg, and a small part of the Walloon province of Liège. On the south end, it has borders with the Flemish exclave of Voeren and its surrounding part of Liège, Wallonia. The Vaalserberg is on the extreme south-eastern point, marking the tripoint of Netherlands, Germany and Belgium. The Belgian Revolution was the conflict which led to the secession of the southern provinces from the United Kingdom of the Netherlands and the establishment of an independent Kingdom of Belgium. Meuse-Inférieure was a department of the First French Empire in present-day Belgium, Netherlands and Germany. It was named after the river Meuse. Its capital was Maastricht. Its territory corresponded largely with the present-day provinces of Belgian and Dutch Limburg. The United Belgian States, also known as the United States of Belgium, was a confederal republic in the Southern Netherlands which was established after the Brabant Revolution. It existed from January to December 1790 as part of the unsuccessful revolt against the Habsburg Emperor, Joseph II. The Brabant Revolution or Brabantine Revolution, sometimes referred to as the Belgian Revolution of 1789–90 in older writing, was an armed insurrection that occurred in the Austrian Netherlands between October 1789 and December 1790. The revolution, which occurred at the same time as revolutions in France and Liège, led to the brief overthrow of Habsburg rule and the proclamation of a short-lived polity, the United Belgian States, through the unification of the region's federated states. 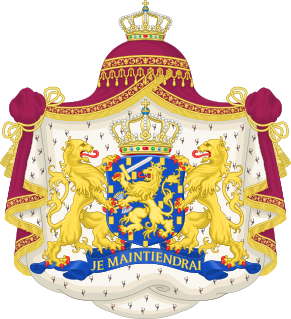 This is a list of monarchs of the Netherlands. By practical extension, the list includes the stadtholders of the House of Orange Nassau since 1556. However, they were voted into office by and were civil servants and generals of the semi-independent provinces of the Dutch Republic and cannot be seen as monarchs. From William IV they were the direct male line ancestors of later monarchs when the monarchy was established in 1813. Belgium in "the long nineteenth century"
The history of Belgium from 1789 to 1914, the period dubbed the "Long Nineteenth Century" by the historian Eric Hobsbawm, includes the end of Austrian rule and periods of French and Dutch occupation of the region, leading to the creation of the first independent Belgian state in 1830. The Committee of United Belgians and Liégeois was a group of exiled rebel leaders from the failed Brabantine and Liège Revolutions who sought to create an independent Belgian republic.